For the experts in the aerospace field, my question might be regarded as a bit "odd", but here I go: is there any reason why we can't use a second turbine to move the propeller with coupled shafts, instead of relying on a gearbox? The idea would be to use a low pressure turbine that moved the propeller. I think this might be unfeasible, because the added weight of a second turbine would be higher than the weight of the gearbox itself, but I don't know if there are additional considerations to this. Propeller rotation shaft aligned with the main engine core (does this even represent an aerodynamic advantage?). The idea would be using two turbines. 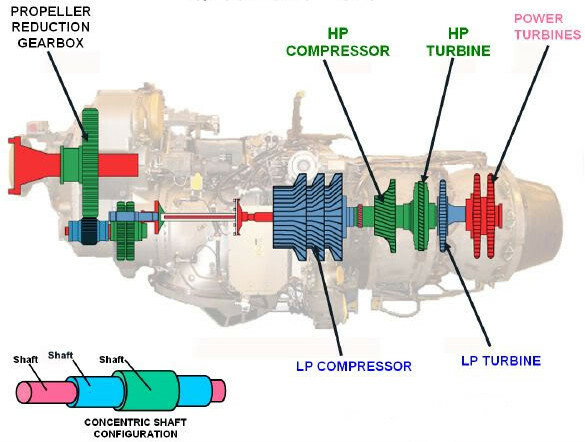 A high-pressure turbine (HP) that moved the compressor, and a low-pressure (LP) turbine that moved the turboprop. My idea was taken from the turbofan engine config. As the user mins pointed out, we would need a very slow turbine or even a gearbox. But we could design the LP turbine with few stages (say 1, 2 or 3) so that its rotational velocity would be low enough as to move the propeller without having aerodynamic losses in the tips of the prop. And as this same user pointed out, there already exists such a configuration (see here). The question then is, why isn't this configuration preferred over the "conventional" one? (i.e. the one that uses a gearbox). 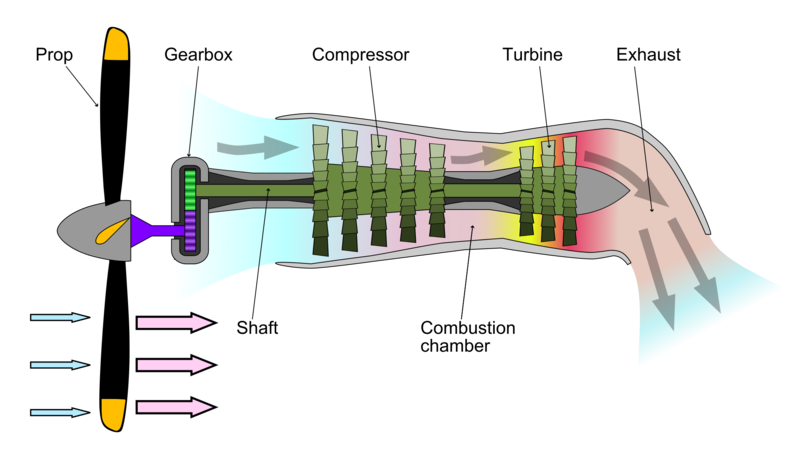 As a side comment, there is a type of engine researched in the 80's/90's, but never marketed, where an unducted fan is driven directly by the turbine shaft without a gearbox: The propfan. It's close to your idea, albeit the unducted fan is not exactly a propeller. Safran has restarted researching on this design, end of 2017, for an operational use after 2030. Having discarded the propfan, let's go to the actual answer! A propeller rotational speed doesn't exceed 1,000 or 1,500 RPM (it depends on its size too). The slowest shaft of a jet engine spins in the range of 5,000 to 15,000 RPM, sometimes more. A reduction gear is used to compensate for the difference. A fan may spin at 5,000 RPM, however the use of a reduction gear is also desirable, though it is often avoided by limiting the speed of the core, at the expense of a loss of efficiency. New aircraft like the A320 NEO can be fitted with geared turbofan engines, for better performance. The reason the turbine cannot spin at a lower speed is that a low speed means low torque, a problem common to many air-breathing engines (maybe except the free turbine). Dotted line: Theoretical torque at low speed. Plain: Actual torque. You may compare with trying to pull away in a hill in fourth gear. Low torque also means increased spool up time, a drawbacks that is often a no-go factor. Jet engines must rotate at high speeds by principle, as a lot of air must be compressed to burn a lot of fuel in a small amount of time. On the other hand the fan or the propeller are more efficient at low RPM. Let's see how engineers have dealt with these two opposite needs in different engine types. The simplest design is the single spool engine (all discs rotating at the same speed). While this is possible, the output shaft is at a high rotational speed. This is usable for a fan which also rotates at high speed. The core compressor is not as efficient as it could if it rotated faster. The Snecma M53-P2, used on the military jet Mirage 2000, has a rotational speed of 10,600 RPM. Better efficiency can be achieved by increasing the compressor speed and reducing the speed of the fan. It requires the use of a distinct second spool. Such configuration is used in many turbofans (Rolls-Royce being a notable exception with a third spool). 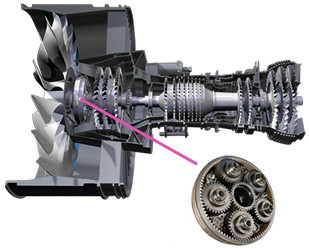 A low-speed / low-pressure turbine drives the fan and usually the first stages of the compressor, and the accessory box. From this EASA certificate, the CFM56-7B used on all B737 NG has a maximum HP shaft speed of about 15,000 RPM and a LP shaft speed of about 5,400 RPM. Increased efficiency needs to further increase the fan diameter but also to slow down the fan to keep the linear speed of the tips at a reasonable value. A slower fan will not be directly driven by the turbine. Slowing the LP turbine adds complexity and also creates a problem: The output torque also decreases (which is a phenomena in all mechanical engines). This leads to increased reaction times after thrust requests, with also means less safe engines. A gearbox is used to prevent sacrificing the precious torque. This unusual configuration is an option on the A320 NEO. PW1000G (formerly known as project GTF) has a HP shaft at 20,000 RPM, a LP shaft at 15,000 RPM, and the fan connected by a 3:1 reduction gearbox rotates at 5,000 RPM. If the altitude is sacrificed for other benefits and the engine is used in denser air, then a turbofan is not anymore an efficient solution. When the fan is replaced by a plain old propeller working at a much slower rotational speed, the use of a speed reduction gearbox with a larger ratio is a required all the more for the same reasons.  The Dash 8 / Q400 which has STOL performances, is equipped with two PW150A turboprops. The PW150A is a two-spool core with a free power turbine (two discs not linked to the gas generation section). The free turbine allows for better propeller speed management, allowing an engine start with the propeller stopped. From its EASA certificate, the HP shaft runs at 31,150 RPM, the LP shaft at 27,000 and the maximum output shaft speed doesn't exceed 1,020 RPM. Note: this schematic is not accurate, but it illustrates the principle. Look with an accurate (but less readable) schematic of the engine sections. Interestingly there is an intermediate solution between the fan and the propeller: The unducted fan. It combines the advantages of a high rotational speed and the lack of duct, the drawback being the noise generated by unducted blades close to Mach 1 airflow at the tip. Testing was conducted by several engine manufacturers but no engine was launched on the commercial market for reasons that appear to be non-technical. 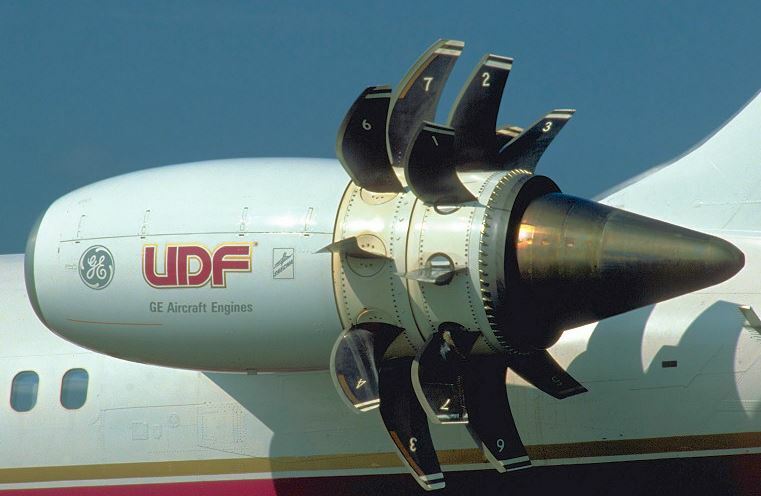 An example studied by GE and Nasa combined a double unducted fan (UDF) and a free turbine in a new type of engine known as propfan, in a pusher configuration. The two counter-rotating fans were mounted directly on the free turbine output shaft without a gearbox. You are right, it is desirable to avoid the gearbox. Big turboprop engines use a two-spool design in which the low pressure turbine is exclusively turning the propeller. However, this also needs a gearbox, albeit with a smaller gearing ratio. The gearbox has been accepted by engine designers as the lesser of two evils, the bigger evil being an excessively large turbine. 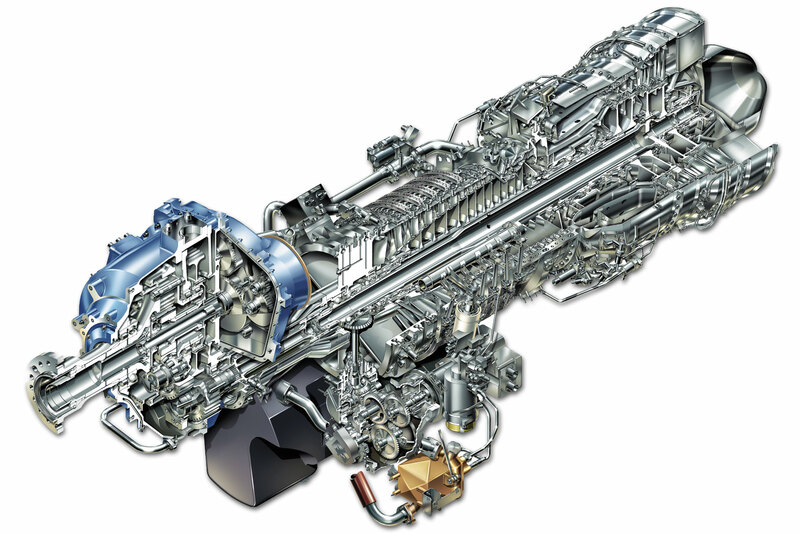 Cut-away drawing of the AE-2100 turboprop engine (picture source). The turbine has four stages, the first two driving the high-speed spool and the 14-stage compressor, while the inner, low-speed spool is driven by the last two turbine stages and is connected to the gearbox in front. If the turbine would spin slowly enough to avoid a gearbox altogether, it would need to be much bigger. This would result in an undesirably large nacelle, causing an equally undesirable drag increase. Also, the larger, slower-spinning turbine will make the whole engine much heavier, not simply because the turbine wheel is larger, but mostly because the engine casing has to become much larger, too. Note in the cut-away picture of the AE-2100 above that the low speed turbine is already the widest component - making it any wider would increase drag and engine mass significantly. The rotational speed of the turbine easily doubles or triples the flow speed at the turbine blade, thus increasing the dynamic pressure at the blade by a factor between four and nine over the dynamic pressure of the axial flow at the exit area of the high speed turbine. A slower turbine would work at a much lower dynamic pressure and will need an increased radius to still give the same torque, which is the product of blade lift and radius. Only the increased number of blades and the increased radius of a much bigger turbine will compensate for the much lower dynamic pressure at the turbine blades. I imagine to turn huge propeller you need a lot of torque. Gearbox multiples the torque. The engine I know reduction is 16:1 so 16 times multiplication. If you don't use gearbox you will need turbine to be the size of the propeller! I don't see any easy way to increase torque generated by turbine. 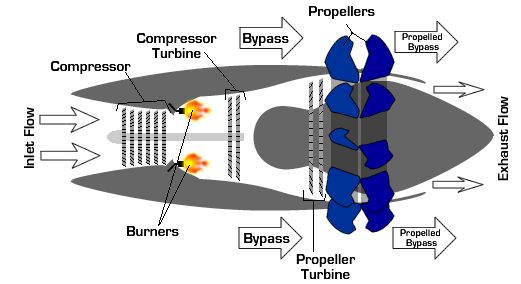 Current turbo props use several turbine discs already so you will need to add 30!!! discs but that will be more complex, expensive and heavy then the gearbox. Also you will need a very strong and big shaft not to mention if it will be aerodynamically effective solution!!! Not the answer you're looking for? Browse other questions tagged turboprop turbine or ask your own question. Can you identify this jet turbine stage? 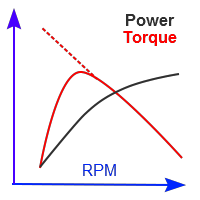 Which are typical rpm values for aeronautical turbines? Why does the Trent XWB have intermediate compressor stages? Can a turbofan maintain torque when spinning fast? Could low pressure compressor blades be made of aluminum? Why do many large turbofans have a gap (of turbine blades) between the LP turbine and HP turbine? What engine are these fan blades from? Why aren’t diesel piston engines used on aircraft like the Saab 340 or L-410?